Before I regroup and get my 2015 resolutions finalized and posted, I wanted to do my final resolution checkpoint of the year, which tends to get forgotten with the buzz of a fresh new year and new resolutions. Revisit IBS books from my bookshelf, now that I'm home. Any new info I can put into action? - Whoops, honestly never cracked those books open. Publish one post every Thursday - I published four posts this month, on my Thursdays! G+ Updates too - Check! Get Korean Food guide to a complete rough draft stage, aka write, write, write! - While I did at least touch it this month, I think it was only one day. This will become a higher priority in 2015. Gain strength & muscle, enough that there's a notable difference in a before and after picture - I went to 7 weeks of Pilates and Zumba classes this fall, plus a few weight lifting sessions, and have signed up for 13-week sessions of "SHAPE" and Pilates starting in January. Add pull-down tabs to both of my Blogger blogs - Really need to update my template in 2015. Resume French study - I slowly picked up speed this month, have turned my phone language to French, and will be making this goal take center stage in 2015. How was your December in terms of resolutions/improvement? Are you getting ideas for 2015 resolutions? Just like last year and in 2012, I'd like to share the books I read this year, and which were my favorites. I've been keeping lists of books I read ever since I was little, and have tracked reading and made yearly reading challenges with Goodreads for the past several years. 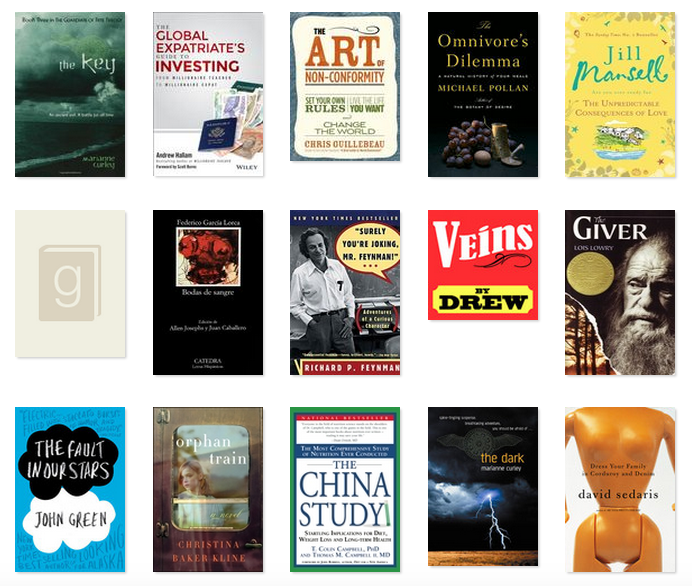 In 2014, I set a goal of reading 32 books and reached it! Here are the books I read this year, starting with the most recent and working back to last January. 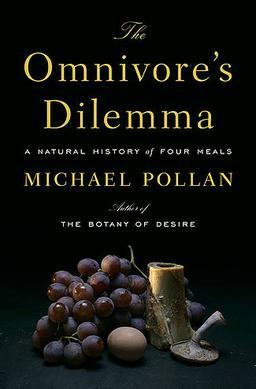 Last month I finished reading Michael Pollan's The Omnivore's Dilemma: A Natural history of four meals—named one of the top 10 books in 2006 by the New York Times. Just like Pollan's other books I've read this year (In Defense of Food, Food Rules, and Cooked), The Omnivore's Dilemma was a fascinating read. Pollan is a gifted writer who conveys important information in a clear, honest, and entertaining way. What I love about Pollan is that he always dives right in and gets involved with the source of whatever he's researching, learning first-hand from various people. Living and working on a "grass farm" and learning to hunt wild boar are just two examples of such involvement from this book. The Omnivore's Dilemma is split into three sections: industrial corn, pastoral grass, and the forest; with their accompanying four meals: fast food, grass-fed, industrial organic, and hunter-gatherer. I never knew reading about corn or the word "organic" could be so interesting! Throughout the book, Pollan points out the problems with the modern American diet, and how they came to be. In the introduction, he writes that this book is the answer to the question "What should we have for dinner?," as well as an exploration of how this basic question became so complicated. I mentioned earlier that it was so interesting to read about corn in the United States (though also a bit depressing and hopeless). Pollan introduces that section by going through a grocery store and common American food items, tracing each back to the same origin: corn. Basically corn is overproduced and also subsidized by the government, and most is used to make high fructose corn syrup, a cheap and unhealthy sweetener for processed foods. A farm family needs a certain amount of cash flow every year to support itself, and if the price of corn falls, the only way to stay even is to sell more corn. Naylor says that farmers desperate to boost yield end up degrading their land, plowing and planting marginal land, applying more nitrogen—anything to squeeze a few more bushels from the soil. Yet the more bushels each farmer produces, the lower prices go, giving another turn to the perverse spiral of overproduction. I liked that I had this background before watching "Fed Up," as the book explains in depth how corn became so cheap, which made it the key ingredient in sodas (high fructose corn syrup) and so many processed foods. What it means to be "organic"
While some organic foods are made on smaller farms that take into account natural systems, the book also explored "industrial organic" farms, as the author names them. These industrial organic farms cause many of the same problems as industrial farms, and aren't much more humane to animals and the land. Pollan shows with specific examples how the picture painted on many organic food labels can be just as misleading as non-organic labels. I loved the chapters that Pollan spends on Joel Salatin's "grass farm" in Virginia, Polyface. It's often called a grass farm because the various species of grass are so important to the overall health of the farm's ecosystem. Everything is connected, and it was a wonderful reminder of nature's beauty to see the interconnectedness of all species and plants, big and small. The reason Joel moves his cattle at the end of the day is because that's when sugar levels in the grass hit their peak; overnight the plant will gradually use up these reserves. It seems the chickens eschew fresh manure, so he waits three or four days before bringing them in—but not a day longer. That's because the fly larvae in the manure are on a four-day cycle, he explained. We also see how this drastically contrasts to cows raised in industrial farms, which are force fed corn (their stomachs are specifically meant to digest grass) which basically kills them. They have to be kept "healthy" by so many antibiotics and shots (there goes big money to the pharmaceutical companies) which in turn gets absorbed into your body when you eat meat from an industrialized farm. It is absolutely cruelty to animals what happens on such farms, and while it's certainly not pleasant to read the details, I'm really glad that I did and am no longer living in ignorant bliss. Without even consciously deciding to change anything, I haven't been ordering meat at restaurants nor buying it from the grocery store. I think the biggest thing most people think about when it comes to industrial farming is the negative impact on animals. What I had never given much thought to before reading this book is the entire environmental impact, and how farming is connected to global warming. For example, if the sixteen million acres now being used to grow corn to feed cows in the United States became well-managed pasture, that would remove fourteen billion pounds of carbon from the atmosphere each year, the equivalent of taking four million cars off the road. We seldom focus on farming's role in global warming, but as much as a third of all the greenhouse gases that human activity has added to the atmosphere can be attributed to the saw and the plow. It was also important to see how these impacts, both environmental and human health-related, aren't taken into account at all when pricing food items. The ninety-nine-cent price of a fast-food hamburger simply doesn't take account of that meal's true cost—to soil, oil, public health, the public purse, etc., costs which are never charged directly to the consumer but, indirectly and invisibly, to the taxpayer (in the form of subsidies), the health care system (in the form of food-borne illnesses and obesity), and the environment (in the form of pollution), not to mention the welfare of the workers in the feedlot and the slaughterhouse and the welfare of the animals themselves. If not for this sort of blindman's accounting, grass would make a lot more sense than it now does. I think many people don't buy organic or grass-fed items because you can get off-brands cheaper, but Pollan makes the point that as a consumer, you can choose to either pay for "honestly priced" or "irresponsibly priced" food. I now keep this in my mind when I'm grocery shopping. While shopping I also remind myself that Americans spend the lowest percent of their paychecks on food compared to any other country, which always gets me to go for the better option. I'm paying for my current and future health when I make good food choices, as well as helping the environment and reducing our country's future health care costs. I highly recommend The Omnivore's Dilemma; why not pick it up from your library this week and start reading it? While the book communicates must-know information about America's food sources, it's engaging and fun to read at the same time. Has anyone else read The Omnivore's Dilemma? What did you think? 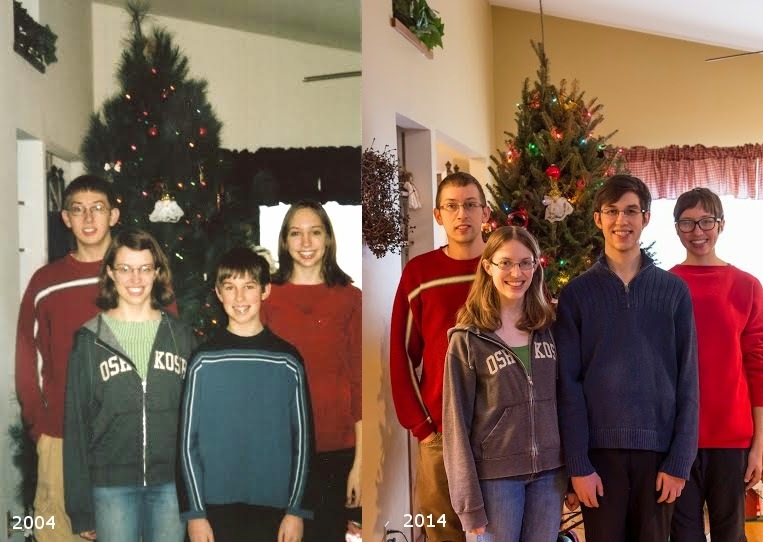 The end of December will mark four full months since leaving South Korea. In some ways, it doesn't feel like it's been that long; I actually just had a dream last night that I was teaching a group of my Korean students. Yet in other ways, Korea feels like a lifetime away—almost as if the whole year had been a dream, some alternate reality of sorts. I recently talked about this feeling with friends who also taught in my program when five of us (the "non-renewers") got together for lunch this past Sunday. We commented that overall, since sliding back into U.S. society has felt as simple as hitting the "play" button again, at times we ask ourselves if Korea actually happened. At least, that's how it feels for me, because it was this completely separate life and hardly a hint of it remains visible today. My bizarre upside-down Korean life! For the first time in the history of the world, more people are dying from obesity than from starvation. That's one of the earlier lines in the movie "Fed Up," which my food blogger brother wrote about in October. Documentary-lover that I am, and with my interest in nutrition and health, I borrowed his copy of the movie and watched it myself. I highly recommend the film, especially for Americans who have never thought about their food before. It's a great, simple introduction to many of the complex problems surrounding the average American's health and diet today. The movie focused on the problem that more children today than ever before in history are becoming diabetic. This is also the first generation expected to have shorter lives than their parents. Why? It's because of what children are eating. The movie follows the stories of a few severely obese children and their families, observing how each is trying to fight the problem. One is a 12-year-old girl who weighs 212 pounds. Another is a 400 pound 9th grade boy from Texas. It was hard to watch at times, only because most of their families were going about helping their children lose weight in the completely wrong way, hence no results. As the rest of the movie explains, this is the wrong way to lose weight and have your health. But I suppose this was part of the point—that directions from our doctors and physicians, coupled with what items in the grocery store are mislabeled to make you think, aren't clear. Society blames people for not exercising enough, they blame the obese person's lack of will power. But that's not the problem. So what's to blame? This film says that sugar is the main culprit, and I believe it. In order to look at the present day sugar and processed food problems, we need to first go back to 1977. The McGovern Report from that year was the first time the U.S. government sat down to write dietary guidelines for the country. But the egg, sugar, dairy and beef industries didn't like the suggestions in the report, as it would have hurt business (surprise, surprise). So under industry pressure, the recommendations in the report were changed. It encouraged Americans to buy more lean products instead of less processed and sugary products. So that's what prompted the '80s to boom with "low-fat" products. Well, how do we know that all of this excess sugar is bad? What are the dietary guidelines about sugar? How can so much be in all of this food if it's bad for us? In 2002, the World Health Organization (WHO, division of the United Nations) put together a document called TRS 916. Original name, I know. The TRS 916 included the recommendation to restrict sugar intake to 10% of your total calories. This is nearly a repeat of the McGovern report, because once again, the food industries didn't like the health recommendation. So because of all their pushback, Tommy Thompson went to Geneva himself and actually told the WHO that if they were to publish the document, the USA would withhold the 406 million dollars they'd promised the organization. Wowzer. So guess what happened? The WHO completely removed the sugar recommendation from the report. Surprisingly (or not?) the USA now recommends that 25% of your daily calories should come from sugar. Yeah, it got bumped from 10% to 25% in our country: two and a half times the original WHO recommendation! How did all of this sugar creep into our diet? Easy, check the nutritional label of anything. Find the sugar line and look at the grams. Now look at the Daily Value %. Oh wait, there isn't one! Yes, food companies are somehow magically exempt from reporting the daily value percent for sugar. On many products, the sugar percentage would be super high, often over 100%—and that's with the daily recommended value that's already 2.5 times the World Health Organization recommendation! The bottom line is that sugar is addictive, it's cheap, so the food companies are thriving off of it, while our health is suffering incredibly. Food companies are here to make money, not to make us healthy. The food industry does not care about your health, no matter what their boxes, labels, and advertisements may try to trick you into thinking. As I've learned earlier this year from reading several books (especially "Whole") and doing some nutrition research, a calorie of x is not the same as a calorie of y. "Fed Up" compares 160 calories of almonds to 160 calories of soda as an example. The almonds have fiber naturally built in (nature knows what it's doing, folks), meaning that it's not absorbed immediately by the body, so blood sugar rises lower for longer. Soda, on the other hand, is absorbed directly through the portal system to the liver. This causes the liver to have a sugar rush, so the organ immediately turns it into fat. A calorie is not a calorie, yet all of the soda companies and processed food companies will tell you the opposite. They want you to focus on calories, calories, calories—because they can turn those up or down as they wish. The documentary also briefly touches on the political muck surrounding fast food and processed food companies. Many, like Coca Cola and Pepsi for example, fund university research and donate to professional societies. This allows them to get studies showing the results they want—which is neither science nor the truth. These companies have teamed up with Michelle Obama's "Let's Move" campaign, to keep her from attacking their industries. The First Lady's original campaign was set to tackle both diet and exercise, but quickly became solely focused on exercise when the big companies heard the message she was going to spread. So companies like Kraft, Coca Cola, Hersheys, Kellogs, etc. signed an agreement with her to remove 1.5 trillion calories out of the market place in 2015. This only comes out to a bite a day for the average child, but that's besides the point. See what their focus is again? Calories. They're taking out a few calories, but these new products have the same amount of sugar. "Fed Up" actually compares processed food and fast food companies to tobacco companies 30 years ago in the way that they target children in ads. They use cartoons, have toys in kids meals, fun play areas in the restaurant, etc. But kids have never seen a commercial for fruits and vegetables, and this completely changes their whole conception of food—which I can attest to, as I was born in 1989. All people born in the '80s and on have been surrounded by these processed food and fast food advertisements their entire lives. Candy bars in check-out aisles of every type of store, fast food in school lunches. I didn't know what real food was until I left the country for the first time my junior year of college and my eyes were opened. The U.S. Department of Agriculture got put in charge of the country's dietary regulations after the McGovern report, which definitely shouldn't be the case. (Conflict of interest, anyone?) Even though school lunch policy was recently "improved," did you know that both pizza and french fries count as a vegetable under our country's policy? You heard me: According to the U.S. government, pizza and french fries are vegetables. Want to know how the pizza remained in that definition? Schwan, a frozen food company from Minnesota, makes 70% of its pizza sales to public schools. So if the government would have declared the truth, that pizza is not a vegetable, pizza sales would have dropped. Another case of special interests being put ahead of public health. So many fast food restaurants operate in schools. If school cafeterias prepared food in the school, as they did years ago, that would fix so much of this health epidemic. Movie narrator Katie Couric asks near the film's end: What if all sodas carried a warning label, like cigarettes do now? What if fast food and processed food advertisements were removed from TV and taken out of public spaces? What if school lunches were cooked at school, removing all fast and processed foods from the building? What a wonderful world it would be! The makers of the movie have created the "Fed Up" challenge, which is fantastic because people need a concrete action in order to change. People may agree with everything in the film, but unless you have a specific action to put in place, old habits will remain. So the challenge is to go sugar free for ten days. Other ways to get involved and keep the conversation flowing would definitely be to watch the film if you haven't yet seen it—better yet watch it with someone (friends, family). Be aware of that sugar line on food labels, check for sugar in the ingredients list, and avoid "low-fat"/"reduced fat" foods. Better yet, stick to the outer rim of the grocery store (produce, fresh foods) and purchase more foods that don't come with a nutrition label. And after you've seen the film, I'd love to hear from you—are you fed up?